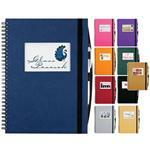 We love this terrific sized all purpose meeting, convention and board room note book. First of all it is spiral bound which means your book lies flat while you write in it. Secondly comes in a wide variety of colors and looks much more expensive with our beautiful deboss print on the front. 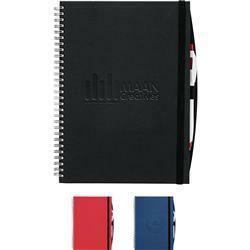 Add a pen for under $.60 each to increase logo views of your company marketing notepad! Customize further by adding a full color "tip in page" where you can list your conference information for additional cost. As shown, free 1 day production. Conference promotional product, FREE 1-DAY RUSH PRODUCTION AVAILABLE! ON SPECIAL! Dimensions: H 10" x W 0.5" x D 7.75"
Typical Imprint Area(s): Spine Left Centered on front 1" up from bottom D 4" x H 1.5"
Spine Left Centered on Front 1" down from top D 4" x H 1.5"
Spine Left Centered on Front D 4" x H 4"
Spine Left lower right corner 0.5" up and in D 2.5" x H 1"
Other imprint areas available, please inquire. color stamp (1 color only), deboss or full color epoxy dome. Additional running charges apply for multiple locations. Please inquire. Color stamp choices include six standard colors (black, white, red, green, blue, brown) and five metallic colors (red, green, blue, gold, silver). Carton size H 17" x W 9" x D 10.5"